Camping this Summer? Let's Talk Blunders! Okay, I'm getting ready to go camping! With 2 kiddos! Now I probably should have asked all of these things before... buuuut that's not what is happening! HA! But maybe there is another mamma that is headed out into the wild with her kiddos that could use your advise! SO I actually don't have any blunders! But I want you to Tell me your craziest camping blunders in the comments below! I have gotten lucky and not had any bad experiences! This trip I'll be pitching our tent right next to friends that have a trailer... so meals between us will be much easier! Some may say it borders on glamping? I'm okay with that though! Best place to relax! A swing for the kids, and score... if someone wants to really rough it and sleep outside, its way more comfy than the ground! This year is my first year NOT bringing a pack-n-play for my youngest to sleep in! He is 4! He wasn't even sleeping in a crib at home last year - but a pack-n-play eased my easily- stressed-mommy-mind that he wouldn't for some reason wander outside in the middle of the night. The very best possibility of making meal-time quick, stress free, and easy - is getting things prepared ahead of time! Think like a church potluck or picnic and bring a bowl of potato salad. (One that fits in your cooler of course.) Open cans, wrap pre-cut veggies in foil, and have easy grab and go fruit and snacks! AND BONUS (because I only said I'd mention 3) BRING WATER BALLOONS IF IT'S HOT! 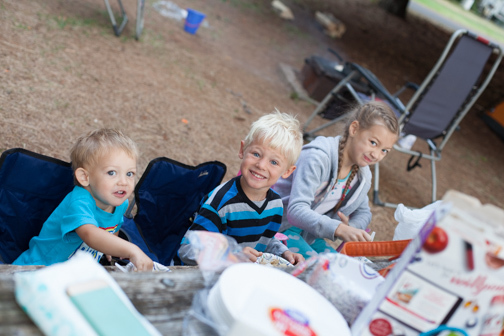 Two Summers ago I went camping with a friend of mine, and we brought our littles... They spent HOURS in front of the spigot at our campsite filling up water balloons. It provided SO much entertainment! And then PS ---> Don't leave without reading this part! I'm hosting a photo challenge this summer! Are you camping too!? You'll have lots of things in the challenge to participate in! If you've followed me for any amount of time, you know that I'm all about helping you make sure that your memories stick! So this is to help you remember to take an active role in that! !